The 65th Texas Legislative Session during 1977 was the last of Dr. Weddington's legislative years." Appointed by Speaker Bill Clayton, she was a member of the National Conference of State Legislature's Standing Committee on Professional Development. Sarah was also a member of the Elections Committee and the State Affairs Committee, chairperson of the State Affairs Subcommittee on State Institutions and State Affairs Subcommittee on Public Utilities, and Dean of the Travis County Delegation. During this year, Weddington sponsored major legislation including HB 898, updating the Presidential Primary statute: HB 331, providing new funding for the arts in Texas by giving cities the option of raising the hotel tax by one percent; and HB 628, creating a central job information center for Travis County residents seeking state employment. Other major legislation she sponsored included HB 1014, allowing university students a voice in use of their student services fees, HB 1135, establishing three new courts for Travis County, HSR 24, encouraging state use of alternative energy sources, and HJR 18, regarding Historical Preservation. Weddington co-sponsored major legislation which included HB 22, Valuation of Agricultural Land and HB 179, giving counties ordinance making powers. 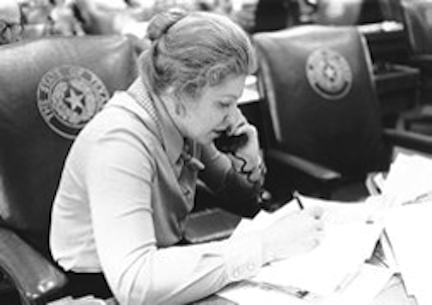 In addition to her legislative duties, Dr. Weddington attended the 1977 National Women's Conference in Houston as a delegate and served on the Women's Equity Action League (WEAL) National Advisory Board. Serving continuously since 1976, she has been a Board Member of the Foundation for Women's Resources—a private, non-profit, educational organization that develops programs and projects to advance and improve the personal, economic and professional status of women. She also began her tenure as a member of the Board of Trustees of the Population Council, an international non-profit institution established by John D. Rockefeller to search for a better understanding of problems relating to population through bio-medical, social science, and public health research. In 1977, Dr. Weddington was listed in Who's Who in Government. Who's Who in American Politics and Who's Who of American Women. She co-wrote Texas Women in Politics, the first educational project of the Foundation for Women's Resources and continued to operate her private law practice. Dr. Weddington continued as a member of the Joint Conference of Representatives of the American Medical Association and American Bar Association. She was also a member of the American Association of University Women, the Business & Professional Women of Austin, the National Organization of Women, the National Order of Women Legislators, the National Federation of Business and Professional Women's Clubs, Inc., the National Reciprocal and Family Support Enforcement Association, the American Bar Association, the Travis County Bar Association, the State Bar of Texas, the Travis County Historical Commission, the Sierra Club, the Travis County Heritage Society, the Personnel Study Advisory Committee of the Coordinating Board of the Texas College and University System, the Texas Historical Foundation, and the Austin Heritage Society. In addition, Sarah was made an Honorary member of Delta Kappa Gamma Society of Texas, the International Society of Women Educators. On July 15, 1977, Sarah Weddington was appointed by U.S. President Jimmy Carter and was later confirmed by the U.S. Senate to hold the post of General Counsel for the US Department of Agriculture.